Bestowed with a 90 rating from Cigar Insider, the Partagás Black Label hand-rolled premium cigar line is an attractive sun-grown beauty unlike any of the other current Partagás cigar blends. Individually handcrafted in the Dominican Republic, every Partagás Black Label premium cigar offers a full flavored and full bodied taste that delivers an unmistakable, bold and rich cigar experience with exceptional value. What makes the Partagás Black Label so unique? Each of these hand-rolled premium cigars are infused with robust blends of Nicaraguan and Piloto Cubano ligeros and wrapped in a well-oiled Connecticut Medio Tiempo leaf from the Connecticut River Valley. 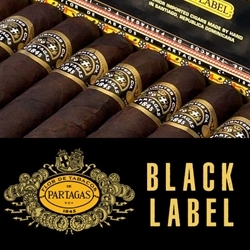 If you looking for a great smoke at a great price, Partagás Black Label are hand-rolled premium cigars that deliver time and time again. Smokers Discounts has made it easy and affordable to buy premium cigars online. Each of these styles, sizes and flavors are in stock and available at a low discount price. Call us for more details!